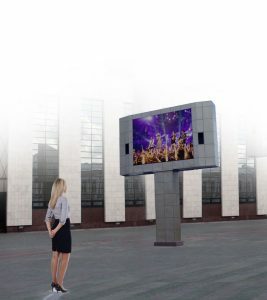 With an already extensive digital signage portfolio, Intermedia Touch now distributes Outdoor LED Displays. From small scale to large curved format displays Intermedia Touch fully customizes each LED Outdoor display, taking into consideration the ambient lighting, viewing distance, display size, weather conditions, marketing needs and more; in order to identify the perfect solution.Ranging between 6mm to 25mm pixel pitch, each display is temperature and environment controlled, eco-friendly, Wi-Fi capable, and most importantly, fully customizable. “With limited space you can offer limitless dissemination of high-impact information to a large scale audience,” says Cristina Miller, Intermedia Touch President. Intermedia Touch has a reputation for delivering high quality customizable digital displays with superior service and business palatable price points. Each display is carefully designed to offer maximum exposure, ROI, and quality.